Plant-based recipes from a fun-loving, world-wandering chef you’ll want to follow everywhere! Chef Lee Watson was once, in his own words, “the mightiest nose-to-tail carnivore of them all.” But four years ago, he went completely vegan—and today, he’s an easygoing evangelist for peaceful, plant-full eating! Sauces, Dressings, Toppers & other Extras: Smoky Chipotle & Cauliflower Cheese Sauce; Tofu & Herb Feta! Lee’s thoughtful, enthusiastic advice makes it easier than you think (and great fun) to create unforgettable meals from an inspiring array of seasonal fruits, fresh vegetables and easy-to-find staples. This is food that explodes with flavor, color and texture—and will delight and nourish everyone. 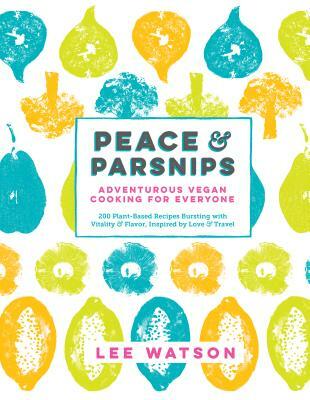 Passionate about vegan food without being preachy, Lee Watson brings a singular sensibility to the vegan cookbook shelf. He has worked in restaurants for more than 20 years, has cooked on TV as one half of the presenting team on Fox’s Meat v Veg and helped open a restaurant on the beach in Murcia, Spain. Besides growing his own organic fruit and vegetables, Lee writes poetry and plays guitar, practices yoga, hikes and runs in the mountains, swims in the sea, surfs and enjoys nature. He lives “the good life” with his partner, Jane, in western Wales, where he works as a vegan chef at an idyllic retreat center in Snowdonia National Park.